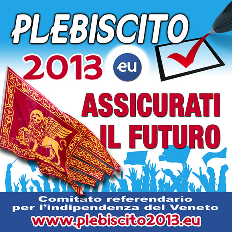 REFERENDUM FOR THE INDEPENDENCE OF VENETO IS JUST ONE VOTE AWAY. A LETTER TO BAN KI-MOON CALLS FOR U.N. MONITORING OF 6 OCTOBER 2013 REFERENDUM. VENICE – It’s actually happening. The wheels are in motion to bring the Northern Italian region of Veneto, formerly an independent state, to a legal referendum that would win back its independence, similarly to Catalonia, Scotland and Quebec. Secondly, considering the urgency stated by the resolution, last week 16 Regional Councilpersons have voted to convene an extraordinary Council meeting to be held this 27th of June to decide whether or not to set an independence referendum for October 6th, 2013. Considering that thus far the majority of the Veneto Regional Council has voted in favor of the Referendum, it is very likely that the motion will pass, clearing the way for a vote asking 5 milion Venets if they want their nation to go back to independence or if they want to remain a region within the much-troubled Italian state. Italian constitution deems illicit to “attempt against the unity” of the Italian State. However similar legislation in Spain has not hindered the Catalonian vote for a referendum, and furthermore European Commissioner Javier Barroso has already expressed himself on the Veneto vote, decreeing that International law overrules national laws. In this specific case, the Italian constitution would be in violation of the U.N. Chart of Human Rights, guaranteeing for all peoples their rights of self-determination. A law passed by the Italian government in 1971 has decreed that the inhabitants of the Veneto are indeed “a people”, meaning a cultural and political entity with a cohesive history, specific language and have existed as a people for much longer that the Italian State, thus making the calling for a referendum technically legal. Behind all this process is the work of the movement Indipendenza Veneta (Venet Independence), that has consistently labored both with several marches of 10 thousand militants on the narrow streets of Venice to demonstrate to the Regional Council the popular resolve to have the right to vote on its self-determination and has feverishly lobbied with the Councilpersons and the President of the Veneto Region in order to push forward the Council votes on the referendum topic. Already, the International Relations Bureau of Indipendenza Veneta, or I.V. as it is known in the Venetia, has drafted an official letter to U.N. Secretary General Ban Ki-moon, to ask for international monitoring of the referendum scheduled for the 6th of October 2013. The letter, undersigned by a large number of Councilpersons and the President of the Region is to be sent any day now to the United Nations’ leader. Now the referendum is finally just one vote away from being called officially by the Veneto region president Luca Zaia, who in recent months has moved his position from cautious, to officially announcing he will vote in favor of the independence of what once was the longest lasting Republic in history, mirroring several opinion polls and survey who indicate that the large majority of the people living in the Veneto region would vote in favor of such referendum, thus re-establishing an independent nation. e un milion de foti par l’indipendensa…. Certo che questi consiglieri si fanno desiderare. Classica mentalità italiana, non veneta, perché durante la Serenissima chi faceva politica era al servizio dei cittadini, invece in italia il politico diventa padrone dei cittadini; tutta un altra cultura!